Declines in the Arctic sea ice are arguably the most dramatic evidence of the effects of current climate warming on ocean systems. Native peoples of the far north have long appreciated and relied upon the migrations of animals with the changing seasons, including some of the largest and least studied, the Arctic whales. While sea ice is perhaps the most defining feature of their habitat, the relationship between Arctic whales and sea ice is still largely a mystery, and there is increasing concern over how these species will adapt to climate related changes in sea ice. Researchers from Florida Atlantic University's Harbor Branch Oceanographic Institute and a team of scientists working in collaboration with Native hunters in Alaska and Canada have just published results of a study in the Royal Society Biology Letters titled, "Genetic Profiling Links Changing Sea Ice to Shifting Beluga Whale Migration Patterns," assessing the relationship between changing sea ice and beluga whale migration as well as summer residency patterns of a number of populations over two decades of dramatic sea ice changes in the Pacific Arctic. The researchers found that beluga whales, often known as the white whale, (Delphinapterus leucas) exhibited a tremendous ability to deal with widely varying sea ice conditions from one year to the next over a 20-year time frame in their return to traditional summering grounds each year. "It was not clear how sea ice influences beluga whale migration patterns and their summer habitat use, and climate change has added urgency to determining how environmental factors might shape the behavior and ecology of this species," said Greg O'Corry-Crowe, Ph.D., lead author and a research professor at FAU Harbor Branch, whose research focuses on combining molecular genetic analysis with field ecology to study the molecular and behavioral ecology of marine apex predators. Using a combination of genetic profiling, sighting data and satellite microwave imagery of sea ice in the Bering, Chukchi and Beaufort seas, O'Corry-Crowe and collaborators also found some dramatic shifts in migration behavior in years with unusually low spring sea ice concentration and in one case with an increase in killer whale (Orcinus orca) sightings and reported predation on beluga whales. For the study, O'Corry-Crowe and collaborators from the University of Alaska; the North Slope Department of Wildlife Management, Alaska; the Alaska Department of Fish and Game; the Native Village of Kotzebue in Alaska; the Alaska Beluga Whale Committee; and the Department of Fisheries and Oceans in Yellowknife, Canada, used genetic "fingerprinting" to investigate the population of origin of whales returning to four traditional coastal sites in the Alaskan and Canadian Arctic between 1988 and 2007. They compiled detailed beluga sightings and harvest data for the same period to assess inter-annual variation on timing of return. Lastly, they analyzed sea ice data in the Bering, Chukchi and Beaufort seas to determine seasonal and regional patterns of sea ice from 1979 to 2014. They used data from tissue samples from 978 beluga whales, which were collected over a 30-year period. 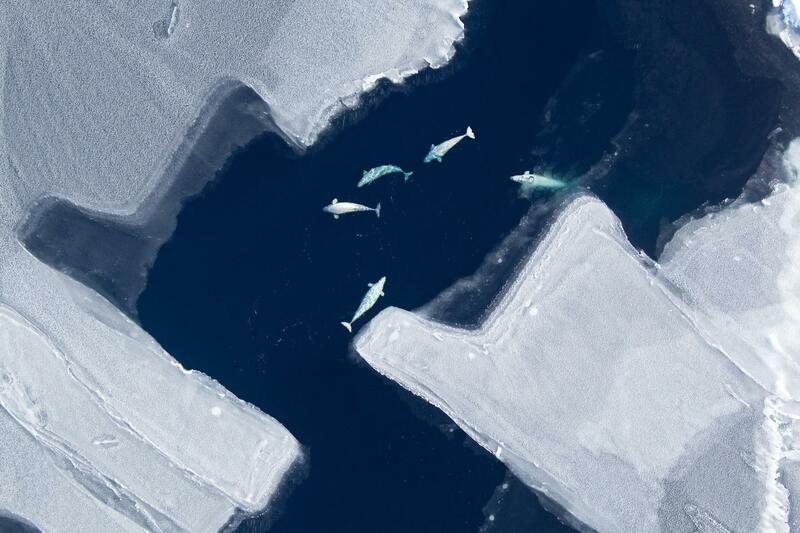 "Continued reductions in sea ice may result in increased predation at key aggregation areas and shifts in beluga whale behavior with implications for population viability, ecosystem structure and the subsistence cultures that rely on them," said O'Corry-Crowe. Co-authors of the study are Andrew Mahoney, Ph.D., University of Alaska; Robert Suydam, Ph.D., North Slope Department of Wildlife Management, Alaska; Lori Quakenbush, Alaska Department of Fish and Game; Alex Whiting, Native Village of Kotzebue, Alaska; Lloyd Lowry, Alaska Beluga Whale Committee; and Lois Harwood, Department of Fisheries and Oceans, Canada.